Columbia College’s Evening Campus recently recognized high-achieving adult students with a ceremony to induct new members into the Nu Omicron chapter of Alpha Sigma Lambda (ASL) honor society Friday, Nov. 5, in Dorsey Chapel. Columbia College Evening Campus students who have achieved a GPA of 3.5 or higher, have junior status and meet residency requirements are inducted each year into the national honor society. Featured speakers included Dr. Gerald T. Brouder, Columbia College president, and Dr. Terry B. Smith, executive vice president and dean for Academic Affairs and professor of Political Science. Originally founded at Northwestern University more than 60 years ago by Dr. Rollin B. Posey, ASL honors dedicated adult students who, while handling their life responsibilities, achieve and maintain high scholastic standards. New Alpha Sigma Lambda inductees pose for a picture after the ceremony. Photo by Kaci Smart. For the nontraditional student, the honor society stands as an inspiration for continuing scholastic growth, and is a builder of pride through recognition. For the chapter institution, the honor society serves as a vehicle for imparting appreciation for adult students’ academic achievements and contributions. The induction ceremony takes place each year in the first week of November to commemorate National Non-Traditional Students Week. To this day Alpha Sigma Lambda is not only the oldest, but largest, chapter-based honor society for full- and part-time students. There are more than 300 chartered chapters throughout the United States, nine of which are Columbia College chapters. The following Columbia College campuses have established ASL chapters: Evening Campus, Online Campus, Ft. Leonard Wood, Mo., Rolla, Mo., Los Alamitos, Calif., Elgin, Ill., Lake County, Ill., Crystal Lake, Ill. and Freeport, Ill. The Nu-Omicron Chapter at Columbia College’s Evening Campus was established in 2008. 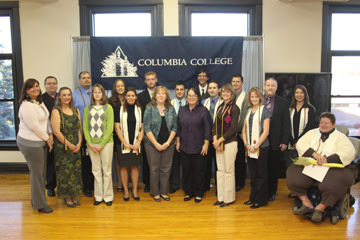 For more information on Columbia College’s Evening Campus, please visit http://www.ccis.edu/evening/.